Ordinance No.1,Series of 2007 - Amending the Display of Signs in the City of Vigan. Ordinance No.6, Series of 2005 - Declaring the Viva Vigan Festival as Abel Iloko Week in Vigan. Ordinance No. 7,Series of 2006 - Vigan Conservation Guidelines as Amended Code. Ordinance No.7,Series of 2008 - Expropriation of property of Gregorio Street Crisologo St. for heritage. 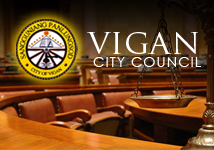 Ordinance No.14,Series of 2002- Creating the Vigan Arts and Culture Council and Fund. Ordinance No.14, Series of 2008-Guidelines in naming and renaming public places, Streets. Ordinance No.15,Series of 2008 - Prohibiting the low pass of aircrafts over Vigan. Ordinance No 4,Series 2000- Enacting the Preservation and Conservation Guidelines for Vigan Ancestral Houses. Ordinance No 6,Series 1994 - Adopting the visit A Museum program and Authorizing the appropriation of funds therefore. Ordinance No 6,Series 1999- Amending certain provisions of the Core and Buffer Zone Ordinance. Ordinance No 8,Series 2000- Regulating the manufacture and sale of furniture within the core zone. Ordinance No12,Series 1997- Defining the Core and Buffer Zone of the Historic Town of Vigan.